Review: This is the second book in the Butterfly Cove series from Sarah Bennett. I recently finished the first in the series and was keen to find out what would happen next with the central characters, their friends and family. I think the title gives a clue to the main event, but there is a little more than that going on in the story. Once again, I found this an easy read and an entertaining way of spending a few hours. Although this is part of a series, it can definitely be read as a standalone, but whets the appetite to find out what transpired before. 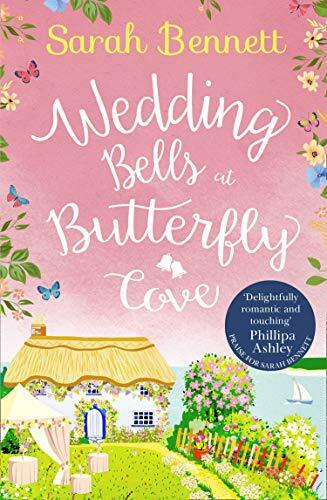 The first book in the series saw Mia renovating a guest house in the beautiful seaside setting of Butterfly Cove with the help of new friend artist Daniel, his best friends Aaron and Luke, and neighbours Madeline and Richard. Although Mia and Daniel's friendship has moved on, this story centres more on Mia's sister, Kiki, who arrives at Mia's guest house with her two young children after finally giving up on her marriage to controlling and abusive Neil. Kiki and the children end up sharing Aaron's cottage since Mia has no room, and she begins to see a chink of light at the end of the tunnel of despair she has become stuck in as these idyllic surroundings work their magic. Everyone is surprised when the third, and youngest, sister, Nee, shows up for the wedding with a shock revelation. I have really enjoyed this sequel to Sunrise at Butterfly Cove and would recommend it to other readers. It was good to revisit the characters I met in the first book and to find them all moving on with their lives. As before, I found them likeable (with the exception of Kiki's husband of course) and so eager to help one another that it makes Butterfly Cove a place you would want to visit, if not to live. I am looking forward to catching up with everybody in the next part of the series.